A couple of months ago I was contacted by an ex work colleague who I worked with at a Melbourne School. She remembered that I loved sewing and wondered if I would be interested in some fabric from her mother's sewing stash. Yes I would! Since we no longer live in Melbourne, my sister kindly visited my colleague's home and picked up some great pieces of fabric. This bold orange, navy and yellow floral was one of my favourites. 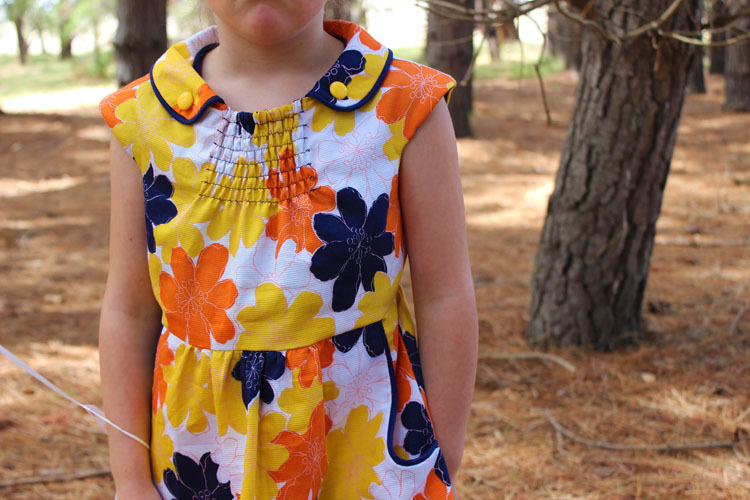 I decided to sew it up with my Dear Prudence dress pattern. I get an extra kick out of making things from thrifted/vintage fabric. Thanks Carolyn! It has been a while since I made a Dear Prudence dress, but I must say, I really enjoy making them and I love the shirring detail at the front and the chance to use piping around the collar and pockets. If you haven't tried shirring before, it is not difficult. Just shirring elastic on the bobbin, long stitch length and sewing through only one layer of fabric. The Dear Prudence pattern has regular 6 mm (1/4") elastic through the casing at the top of the shirring rows, which helps to draw the whole section in. My pattern also provides lots of tips on how to achieve good shirring and some troubleshooting if things aren't looking right. 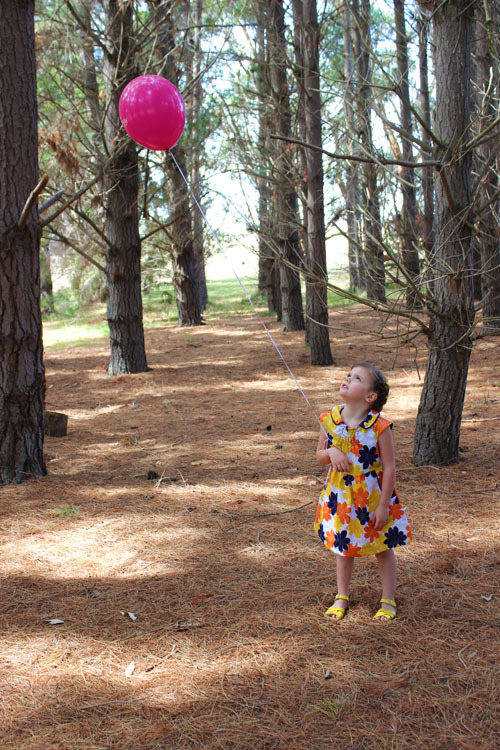 We visited the shops today and Emily was given a balloon which was a good excuse to get her outside for some photos. 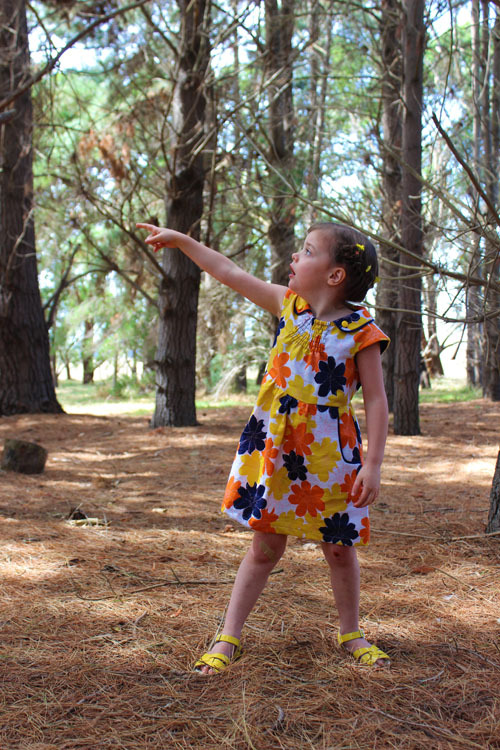 She wanted the photos in our pine forest...if you haven't followed my blog until recently, you may not know that we live on a big property and that in the far corner of our block we inherited a huge pine forest! Approximately 50-60 trees, all standing at around 30 metres! 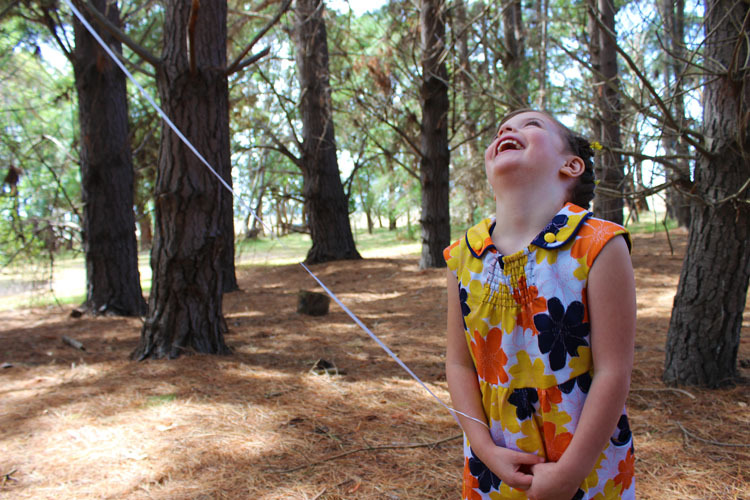 I love the light in the forest, and the girls love building cubbies and showing their friends our very own forest. 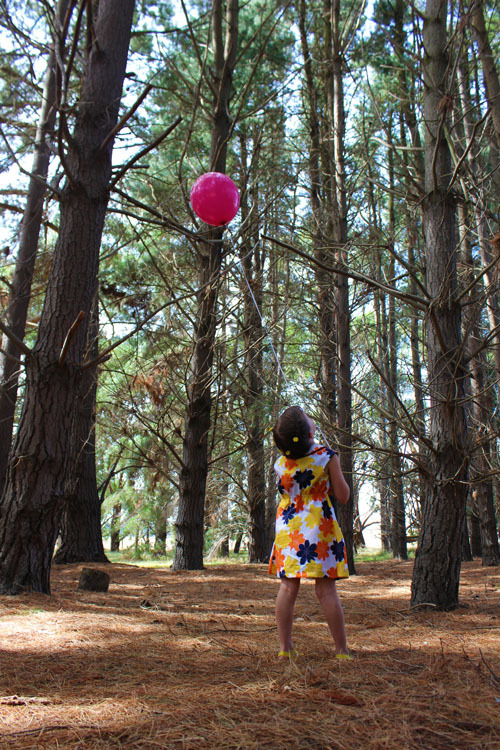 Unfortunately, while Emily was bouncing the balloon around, it slipped off her wrist and quickly lodged itself far out of reach under the branches of one of the trees. 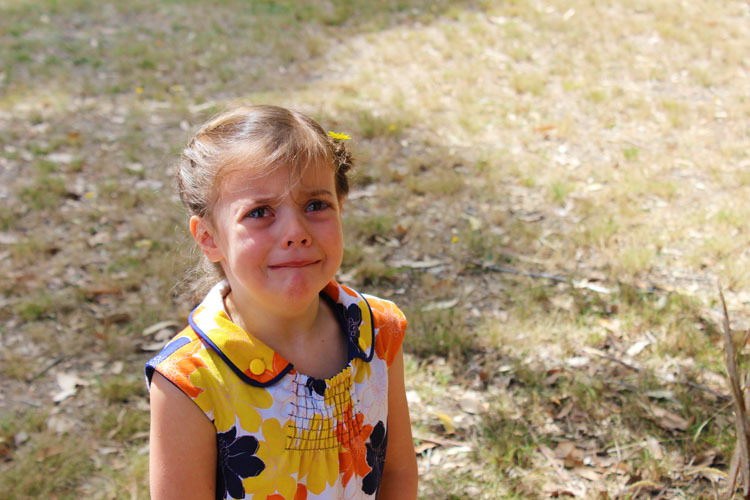 After ten minutes of crying, she finally calmed down and I promised to get her another one next time we went to the shops! Have you sewn up a Dear Prudence? I released it prior to being on instagram so you may not find many hashtags over there...would you like to make your own? You can use the code: DEARPRUDENCE10 to receive 10 per cent off for the next week. Apply code at checkout in my etsy shop. 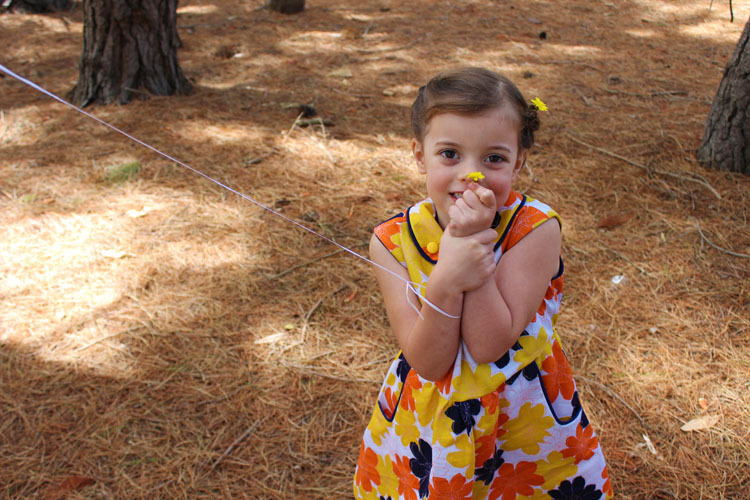 Oh sweet Emily :) I just want to give her a hug and a new balloon :) Her new dress is stunning! This vintage fabric was meant to be used for this dress, it matches the character of the pattern perfectly. Dear Prudence is still one of my fave patterns. Thanks Jenya! She got over it and a few hours later we went and visited the balloon - it was still in the same spot! This dress is so gorgeous in that vintage fabric!! I've always been nervous about shirring, but maybe it's time to give it a go! Especially as I've admired this pattern for so long 😍 She's such a cutie! So pretty, and that vintage fabric is gorgeous and very you! 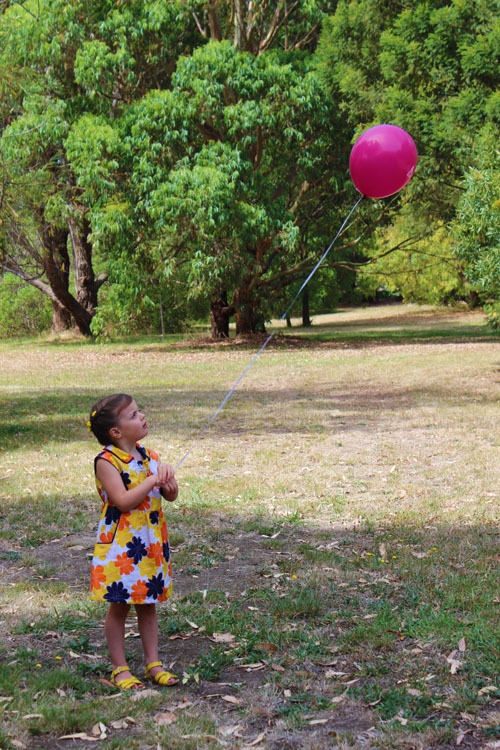 Poor Emily - sadly, losing a helium balloon is an essential part of childhood, I reckon! So lovely! Great use of that vintage fabric. I was just thinking of this dress this week 'Mmm what was that dress with the shirring detail???' Now I found it!